Apple’s App Store hit another milestone this week. Apple says its online retail outfit for iPhone and iPod touch programs now has 15,000 apps available for download and that customers have downloaded 500 million apps. Apple released the news in an advertisement on Friday that ran in the New York Times, Wall Street Journal and USA Today. A little more than a month ago Apple had hit the 300 million download mark and boasted 10,000 apps available in the App Store. 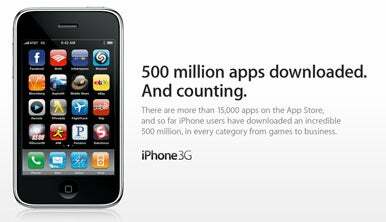 The App Store opened just over six months ago on July 11, 2008 with 500 apps available for download.